Welcome to MarvelPlotPoints.com! 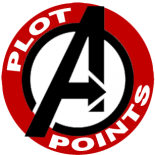 To kick off the new year and the resurrection of the site, we decided to register marvelplotpoints.com. Gone is our .wordpress.com site, (though that will redirect here). We hope to keep bringing you fresh new content for weeks to come! We’re going to give you a little preview of what’s coming in the following weeks. Next week, we’ll have S.H.I.E.L.D. 1950’s week, with Peggy Carter and some of the Brotherhood of the Shield (from Hickman’s S.H.I.E.L.D. comic series). The following week will be… Star Wars Week! To celebrate Star Wars’ return to Marvel Comics, we’ll be devoting an entire week (with tons and tons of datafiles!) to the heroes of the Rebel Alliance and villains of the Galactic Empire! As I said, by popular demand, we’ll be returning to Spider-Verse. There have been so many Spider-Men requested both in the comments, on our Facebook Page and on Twitter, we’re going to do even more Spider-Men for everyone. Following that, we’re exploring the halls of Asgard, with a whole week devoted to the the Norse gods. After that? Well, we’ve got plans all the way into March, so you’ll have to keep your eyes open! I’m so honored to be a part of this and so excited for what is to come! Congratulations on the site, guys! I have always eagerly come here to see if there was anything new was posted for the Marvel game, (specially after the game company shut down the line.). The posts have been just incredible! Please keep up the good work. And in the words of the great Stan Lee, Excelsior!! This entry was posted on January 1, 2015 by Mark in News.